The main difference between epigeal and hypogeal germination is that in epigeal germination, the cotyledons emerge out of the soil during germination whereas, in hypogeal germination, the cotyledons remain inside the soil. This means the hypocotyl shows a greater elongation in epigeal germination while the hypocotyl is short in hypogeal germination. Epigeal and hypogeal germination are the two types of seed germination methods exhibited by seeds during their development into a mature plant. Germination begins with the imbibition of water into the seed, which in turn increases the metabolism and cell division inside the seed, leading to the enlargement of the embryo. The embryo penetrating the seed coat is the conclusion of the germination process. Epigeal germination is the type of germination in which the cotyledons rise out of the soil due to the elongation of the hypocotyl. The hypocotyl is the part of the stem of an embryo plant beneath the stalks of the cotyledons. After emerging out of the soil, these cotyledons are called seed leaves, which become photosynthetic as well. 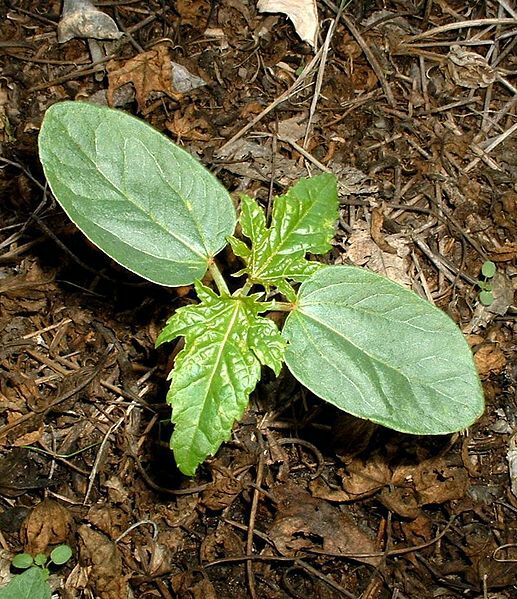 The second leaves derived from the plumule become true leaves. Epigeal germination occurs in castor, cotton, onion, papaya, etc. In addition to food storage, cotyledons undergo photosynthesis and produce food for the development of the embryo. Hypogeal germination is the other type of germination in which the cotyledons remain inside the soil. Therefore, its hypocotyl is short. The epicotyl, which is the region of an embryo plant above the cotyledon, grows longer while pushing the plumule out of the soil. All monocotyledons such as maize, rice, wheat, and coconut show hypogeal germination. However, some dicotyledons such as groundnut, gram and pea show hypogeal germination. Epigeal and hypogeal germination are two methods of seed germination. They are characterized by the relative position of the cotyledons to the soil during germination. Epigeal germination refers to the germination of a plant that takes place above the ground while hypogeal germination refers to the germination of a plant that takes place below the ground. In epigeal germination, the cotyledons emerge out of the soil while in hypogeal germination, the cotyledons remain inside the soil. 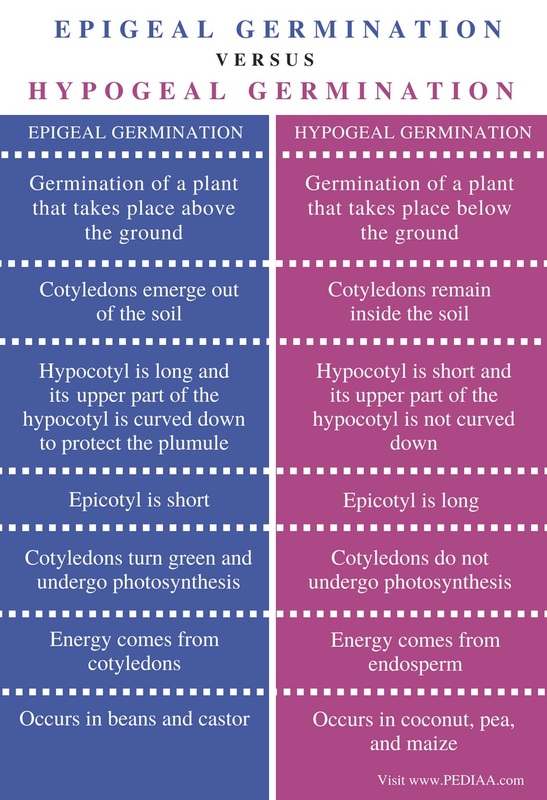 This is the main difference between epigeal and hypogeal germination. The hypocotyl is long in plants that show epigeal-gemination while the hypocotyl is short in plants that show hypogeal germination. Further, the upper part of the hypocotyl is curved down to protect the plumule in epigeal germination while hypocotyl in hypogeal germination does not feature this curvature. Epicotyl is short in plants that show epigeal germination while the epicotyl is long in plants that show hypogeal germination. The cotyledons in epigeal germination turn green and undergo photosynthesis while the cotyledons in hypogeal germination do not undergo photosynthesis. In epigeal germination, the energy comes from the cotyledons, while, in hypogeal germination, the energy comes from the endosperm. Epigeal germination occurs in beans and castor while the hypogeal germination occurs in coconut, pea, and maize. In epigeal germination, cotyledons emerge out of the soil while, in hypogeal germination, cotyledons remain inside the soil. The relative position of the cotyledons is determined by the length of the hypocotyl. Hence, the hypocotyl grows long in epigeal germination while the hypocotyl is short in hypogeal germination plants. The main difference between epigeal and hypogeal germination is the relative position of the cotyledons to the soil.